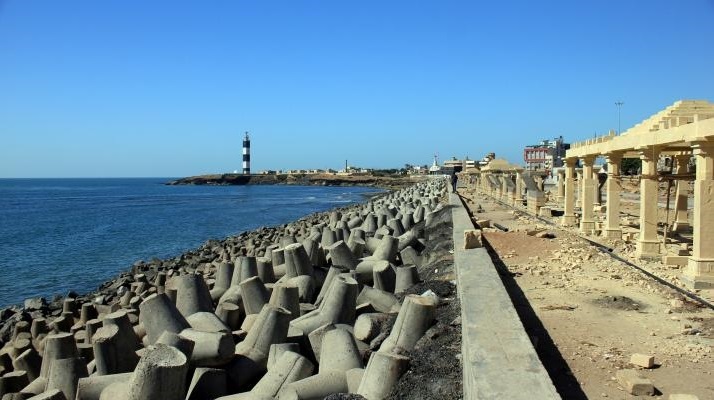 Dwarka in ancient Anarta (Saurashtra) was the capital of Lord Krishna's terrestrial kingdom. He shifted to Kusasthali which was the old name of the region to escape the harassing raids of Kansa's father-in-law Jarasandha on Mathura after Krishna had killed Kansa. Kusasthali was Krishna's ancestral place on his mother's side. It was founded by Raivata, his Yadava ancestor after he had lost his kingdom to Punyajanas and migrated to Mathura for safety; then he came back to found Kusasthali. So Krishna's migration to the Dwarka was in the reverse order. 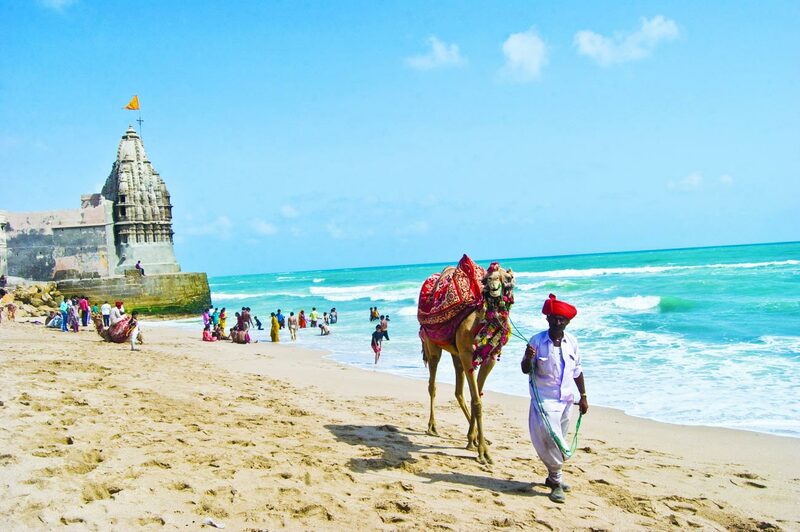 Dwarka which was known as Suvarna Dwarka (The Golden Dwarka) had been very prosperous and hence got the name. 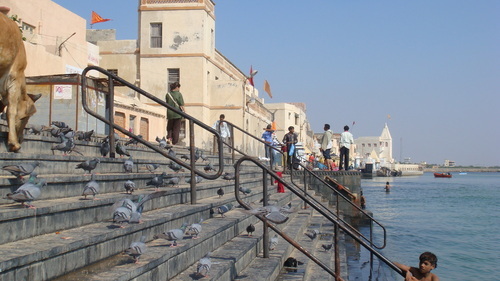 The Dwarkadhish temple honours Krishna Bhagwan and attracts thousands of pilgrims from different parts of the country. The Dwarka of Krishna's time lies submerged under the Arabian Sea. Tradition has itthat Krishna's residence was at Bet Dwarka, a few kms from the mainland Dwarka. 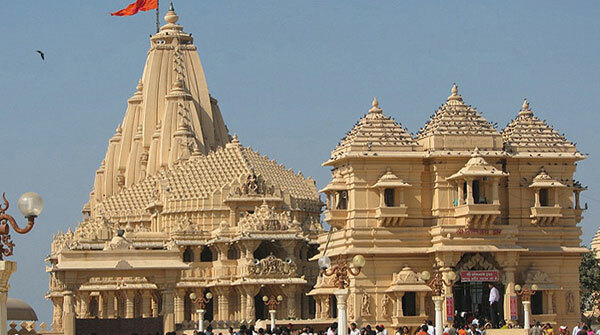 The Dwarkadhish temple (also known as Jagat temple) and its Sikhar rises to 170 feet. The pataka or flag of the temple is changed three times a day. Pilgrims and devotees vie with one another to pay for the flag. There are special tailors to stitch it. Before hoisting the flag it is taken round the temple by the donor. The five-storeyed temple stands on 60 pillars. The pilgrims enter the temple by Swarg Dwar (the gateway of heaven) and leave by Moksh Dwar (the gateway of salvation). The temple has rich carvings. The ancient shrine has been supported by kings and commoners alike from its inception. It is one of the important moksh dhams. The Gomti River flows nearby. The other temples in Dwarka are the Trikamji temple, Kalyanrai temple, the Patrani temple, Durvas temple, etc. Sharda Pith set up by Adi Shankaracharya imparts instruction in Sanskrit. Darukvan in the region is one of the Jyotirlingas. By road: State transport buses and luxury coaches are available from different parts of Gujarat. By rail: Connects Dwarka and Jamnagar, 132 kms. away. Connecting Mumbai (945 kms.) via Rajkot (270 kms.) and Ahmedabad (453 kms. ).